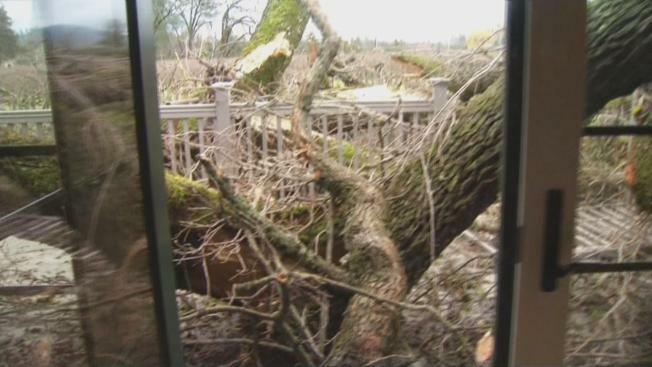 A Napa County family dodged a disaster when a giant oak tree came crashing down their home during this past weekend's powerful storm. The heritage oak, which was hundreds of years old, came down on the side of a guest house at White Hall Winery in Saint Helena. The damage to the home included a large hole in the ceiling of the kitchen. The home's bedroom caught the brunt of the impact. "We're fortunate nobody lives here full time," White Hall Winery owner Katie Leonardini said. "We will do the best we can to make it right again." White Hall Winery owner Tony Leonardini has slept in the bedroom before and is still in shock to see it crushed. The Leonardinis said their friends got married under the tree, which served as an amazing backdrop. Winery owners speculate the tree sucked up the rain water, became top heavy and then succumbed to the wind gusts that hit 50 mph. The damage to the home is estimated between $50,000 and $75,000, according to the Leonardinis.